Living with an amputation can be difficult without quality care and rehabilitation. Losing a limb is a personal loss and many people will suffer from grief, depression or anxiety following amputation. Beacon Support offers leading after amputation care in the home to support your amputation rehabilitation and ongoing needs. In the immediate period following an amputation, you can expect some pain that will be managed with medication. During amputation rehabilitation, a compression garment may be used to help to keep the swelling down. The compression garment will require regular changing and the wound must be correctly cared for to guard against infections. We work in coordination with other services such as a physiotherapist, occupational therapist, and any other medical professionals, to ensure you get the best after amputation care in home. During the amputation rehabilitation, you may be given support on how to carry out everyday tasks. In the case of leg amputation, you may require support on how to use crutches or a wheelchair. After any swelling has gone down, you may then receive a prosthesis. 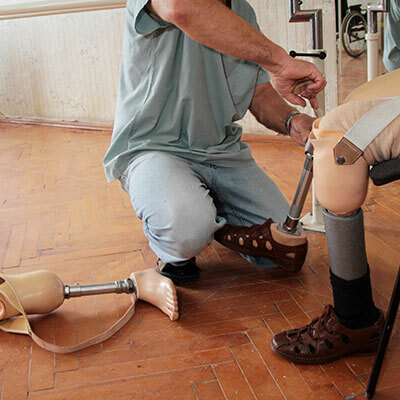 We can help you with managing your prosthesis as part of your amputation rehabilitation. Prosthetic limbs are not suitable for everyone, and for those that have one fitted, learning to use it can be a challenging process. It is vital that the after amputation care includes regular exercise to keep the muscles in the body toned. We can provide support so you can stay in good physical health. If you are having a limb amputated and you’re under 65 you can apply to the National Disability Insurance Scheme (NDIS) for after amputation care. As an NDIS service provider, we can help you to live the life you want with funded support and care. You will meet with a planner who will discuss your life goals with you and then help you to develop a home care plan that will offer you the support and care that you need to support your lifestyle goals. You may need to make modifications to your home, and we can assist you with advice on this and on the availability and suitability of assistive devices. With the right care, most amputees go on to live full and active lives, with full amputation rehabilitation taking between six and 12 months. We can also provide after amputation care in the home for amputees who don’t qualify for NDIS funding. Contact us today to find out more about our after amputation care in-home services.